The hip joint is a ball and socket joint connecting the upper thigh bone (femoral head) with the pelvic bone (acetabulum). It is one of the largest and most stable joints in the body. The surfaces of the bones are covered by a gristle like surface called articular cartilage. It is smooth and slippery. This allows for a pain free range of movement, as well as cushioning of the underlying bone. The joint is covered by a thin lining of soft tissue called the synovium, which produces a small amount of fluid in a healthy joint. This is a degenerative condition where the gristle, or articular surface, wears away. The surfaces become deformed, rough and irregular and eventually leading to bone rubbing on bone. The synovium gradually becomes inflamed and thickened with time, and this, in addition to the irregular surfaces, causes significant loss of joint movement. 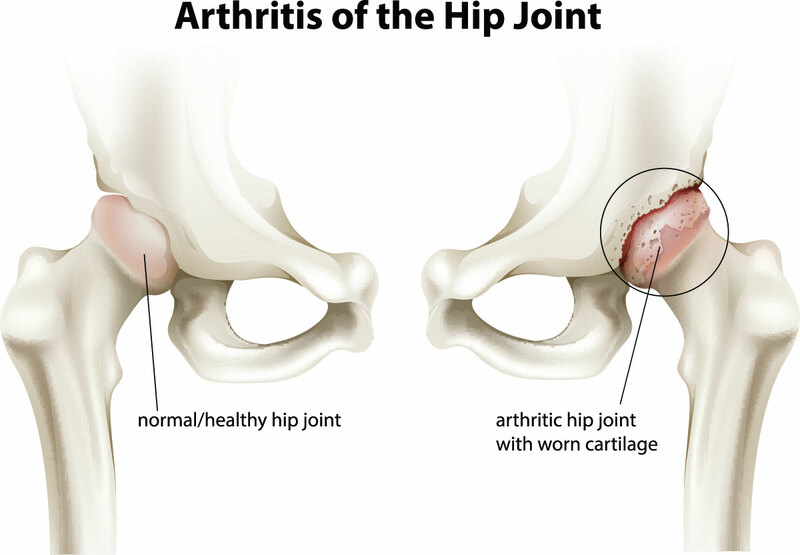 Osteoarthritis of the hip is a very common condition in middle aged and older people. As the hip joint is a weight bearing joint osteoarthritis is much more common in the hip than it is in the joints of the upper limb. It usually presents with pain and stiffness, particularly during activity. It most commonly occurs in middle aged and older patients, and is degenerative in nature. There are some families that have a strong history of hip osteoarthritis. Hip dysplasia or underdevelopment of the hip joint is a significant cause of hip osteoarthritis. It is more commonly seen in female patients. Femoroacetabular impingement is another causative factor. It is more commonly found in younger to middle aged male patients who have played a high level of fast running sports such as football. This is a significant factor in the development of osteoarthritis. Obese patients have twice the incidence of this condition compared with those of normal weight. This includes slipped upper femoral epiphysis or Perthes disease. These include injuries to the hip such as fracture to the neck of femur or acetabulum. The most common symptom is pain. The pain may be in a number of areas but is usually in the groin or deep in the hip region. It may also occur in the side of the hip and in the buttock. In some patients the pain will refer to the thigh, knee, and even the shin. It gradually progresses over a number of years but sometimes may deteriorate quite quickly. It is often associated with stiffness, which causes difficulty in changing position and putting on shoes and socks. Some patients complain of locking or catching in the hip. The surgeon will observe the patient walking as well as check for any leg length inequality. The range of movement of the hip is usually diminished and there may be some pain or discomfort on moving the joint. In most cases x-rays of the hip are sufficient to make the diagnosis. Only occasionally would an MRI be helpful, where the diagnosis is not clear-cut on x-rays. This can be of some help but probably can only offer minor gains in improving symptoms. Medications that may be helpful include Panadol Osteo, taken on a regular basis as well as taking non-steroidal anti-inflammatory drugs such as Nurofen or Voltaren. Sometimes a steroid injection into the hip can be helpful in the short to medium term. However, this injection is best avoided if the patient is contemplating hip replacement surgery in the near future as it may potentially increase the risk of infection if done within 3 months prior to surgery. When osteoarthritis is advanced hip arthroscopy will be of no benefit. There are some patients who present with quite significant femoroacetabular impingement and mild arthritis. 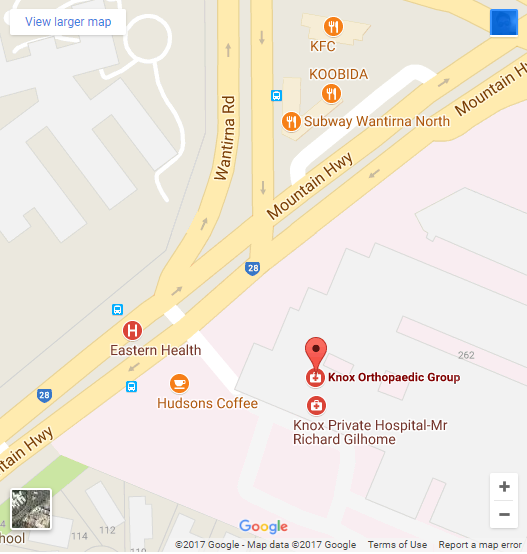 Hip arthroscopy can often provide symptomatic relief in these cases. This procedure is performed for people with hip dysplasia. It can be performed when the arthritis is mild to moderate. Once the arthritic condition is more advanced then it is preferable to simply perform a hip replacement. In this procedure the worn out hip joint is replaced. Prosthetic devices include a femoral stem and ball head, and an acetabular cup and liner. This is an excellent procedure when conservative treatment has failed or when the pain and stiffness are quite disabling. These options will be discussed with patients at the time of consultation. For more information view Total Hip Replacement.